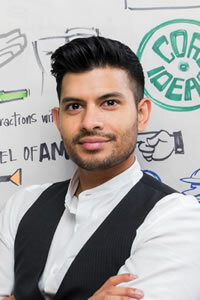 Shawn Kanungo is a strategist and keynote speaker who operates at the intersection of creativity, business and technology. He has been recognized nationally and globally for his work in the innovation space after 12 years working at Deloitte. Shawn’s mandate at the firm was to help corporate executives to better understand and plan for the opportunities and threats associated with disruptive innovation. Now as General Partner of Queen & Rook Capital, he is focused on applying exponential technologies and new business models to mature businesses. Shawn is a practitioner who has worked hand-to-hand with hundreds of organizations on their journey to digital transformation. He has adopted the concepts of behavioural economics, user-centered design, crowdsourcing, artificial intelligence, drones and film to help create world class client experiences. His work and interviews have been featured in Forbes, The Globe & Mail, The Guardian, CBC and CTV. In 2016, he was recognized as Avenue Magazine’s Top 40 Under 40. He has spoken at TEDx in 2017, and named to Inc’s 100 Most Innovative Leadership Speakers in 2018. His podcast, The Remix with Shawn & Wang, can be currently found on iTunes, Google Play and Stitcher.